Experience Old World Elegance with uncompromising service and gracious hospitality! 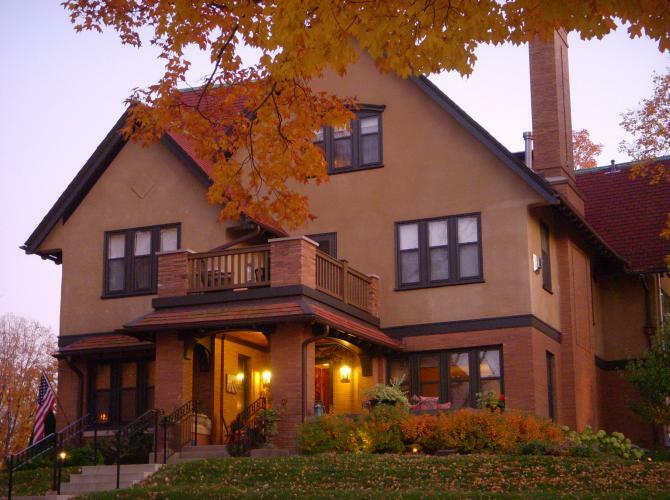 The Westphal Mansion Inn B & B is a local historical landmark that overlooks picturesque and historic downtown Hartford. The inn was opened for business in September 2007. 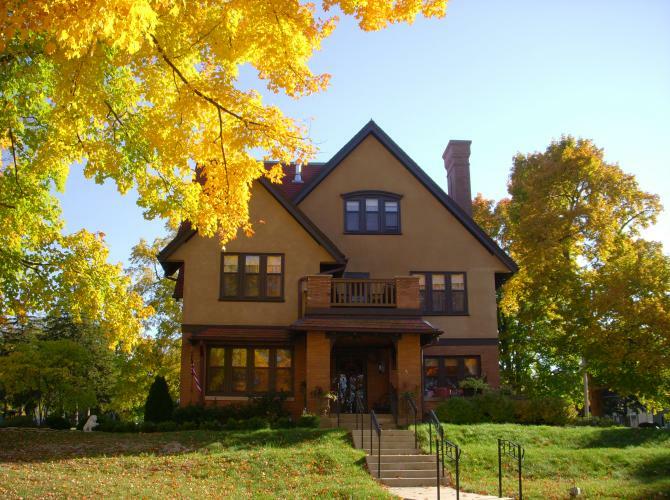 The stately English Tudor mansion was built in 1913 for August and Mary (Schott) Westhpal as a single family home with a business office and vault room on the second floor. There was a ballroom and servant quarters on the third floor. The charm, grace, history and hospitality of the Westphal family and their grand home has been retained by Pamela and Garret Terpstra, the new owners as of October in 2005. As their own home enjoys its new life as a bed and breakfast. The office space has been converted into the Innkeepers Suite where Pam and Garret reside. Wrap yourself in luxury while enjoying the beauty of this English Tudor old world charm, joined with the comfort and elegance of todays discerning guests expect. The innkeepers have retained all of the original architectural features and attention to detail has been lavished throughout the mansion. Graceful high ceilings and fine detailed carved plaster moldings are visible, also natural oak woodwork, vintage mantel surrounds large sunny windows and French doors all blend beautifully with period antiques and family heirlooms to create a classic European atmosphere. Each of the eight luxurious suites has been named after an author from the owner's family literary book collection. Eight guest suites abounds with wonderful warm colors, hand painted murals, antiques, richly textured fabrics, elegant linens, vintage queen and king beds, cozy down comforters and fresh flowers. Decadent chocolates and homemade cookies at bedtime, turndown service and concierge service is available for dining reservations and area attractions. Flat Screen TVs, DVD players, wireless Internet, and ADA accessibility is also available. The inn is air conditioned, carefully blending the ambiance of yesteryear with today's comforts. Some suites include a vintage gas fireplace, an air bubble massage tub or private porch with a beautiful view. 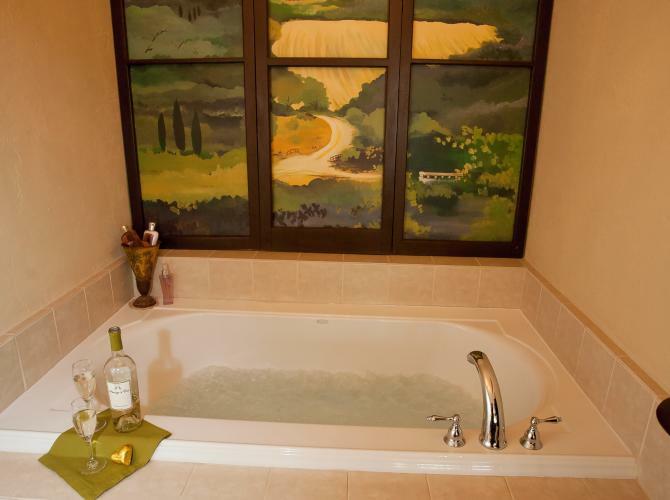 Elegant ceramic tiled, private attached baths, offer vintage soak tubs, showers and plush towels and robes. The morning begins with gourmet tea or coffee followed by an elegant full breakfast of homemade favorites. Enjoy breakfast in the beautifully preserved dining room, or on one of the porches, or room service is available. Join us for an afternoon wine and cheese reception. In the summer months guests can enjoy a walk through the English Gardens or relax in the outside garden room listening to sound of falling water of the 1917 fountain. In autumn and winter a crackling fire invites quests to cozy up with a favorite book or play a game of chess next to a warm fireplace in the living room. 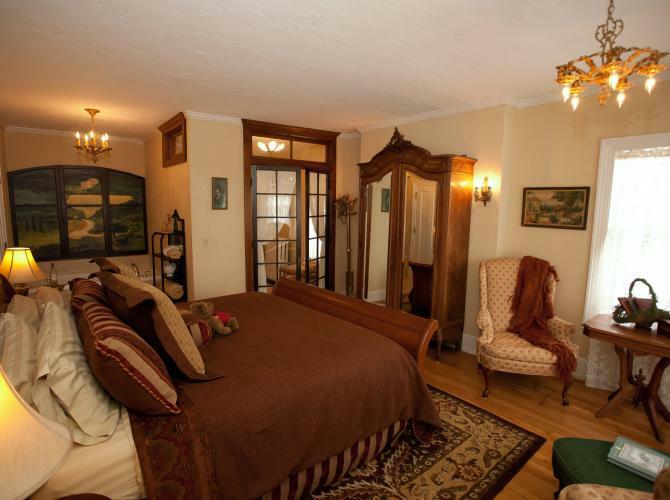 Perfect for romance, relaxation, showers, sightseeing, business, or small weddings, the Westphal Mansion Inn B&B is perfectly located for exploring everything historic Hartford has to offer. Come, enjoy our passion for this incredibly rich historic city and discover the unique shops, restaurants, and theater of the arts, museums, golf and state parks. Our Inn's gardens are starting to Bloom and ii is the perfect time to enjoy the warm/cool days of Spring! Come and relax with that Special someone and receive any available suite during April or May 2019 for $150.00 per night plus tax. Wake each morning to a 4 course Homemade Breakfast and Decadent Dessert! Start with a cup of Stone Creek Coffee or Harney & Son's Tea! Take a short/long walk in the near by Parks, or stroll 1/2 block away through Historic Downtown Hartford, WI and experience the sounds and sites of nature!